Brooklyn Nine Nine’s favorite guest star returns as Doug Judy enters Jake’s life once again. Terry has reports of a car thief that employs all of the Pontiac Bandit’s old tricks. Terry is convinced that Judy has returned to his life of crime and again tricked Jake about going straight, as he typically does. Jake refuses to consider that possibility, though, going so far as pulling out the “one thousand pushups” bet he and Rosa came up with. Attempting to make contact with Doug Judy, Jake and Terry end up at his “funeral” (meeting his sister Trudy in the process) where Judy reveals himself to Jake. The bandit explains why he faked his own death, hiding from a man named Stefanos who’s also convinced that Judy stole that car. An all-too-predictable twist reveals that Trudy was the one who stole the car. The rest of the episode is just as predictable too. Doug Judy, Trudy, Jake, and Terry work together to arrest Stefanos and reduce Trudy’s sentence. However, she staged a ruse to help herself escape police custody using Doug’s own notebooks against him. She flies off into the unknown just as her brother used to. The rest of the squad arrives at Shaw’s only to find out that some of the FDNY have taken over. One of the firemen (Rob Riggle in a wasted role), tries to bully them out. Eventually the two factions engage in a drink off, with the winner claiming the bar as their own. Holt doesn’t have the same attachment to Shaw’s and leaves mid-competition. This plot was predictable as well. 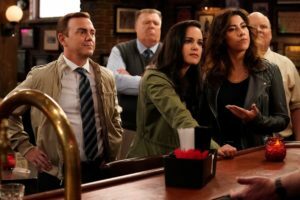 Holt eventually returns, the 99 wins the drink off, and gets to keep Shaw’s as a police bar. Both plots had amusing moments but ultimately were too predictable for me to fully enjoy. Plus, Rob Riggle wasn’t used to his full potential. Return of drunk Amy (with a revelation that 9-drink Amy can speak French). Doug and Jake’s friendship. It’s just so pure. The Cheers reference (I just love Cheers ok).